The Serta Mattress Company was founded in 1931 in Illinois as Sleeper, Inc. They remain known for their popular lines of traditional innerspring, gel-infused memory foam, hybrid and a talalay latex mattresses is a dominant bedding manufacturer. In addition to their US facilities, they have factories in more than 100 countries around the world. 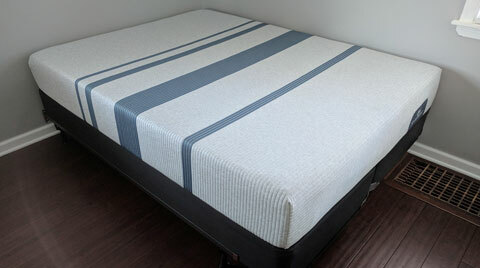 Serta recently sent us their iComfort Blue 100 Gentle Firm mattress to review. We put together our findings below. 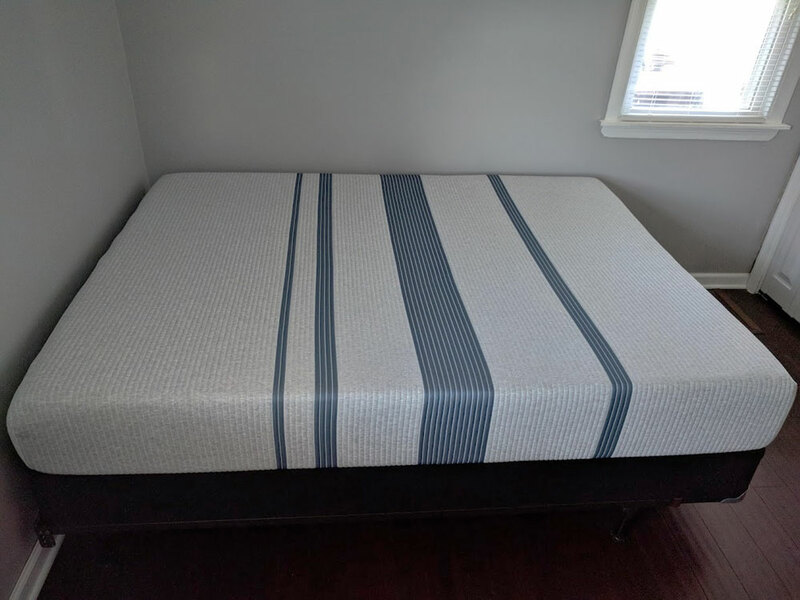 What type of mattress is the Blue 100? The Serta iComfort Blue 100 is a value priced spring-less memory foam mattress. It combines support, comfort and cooling technologies. 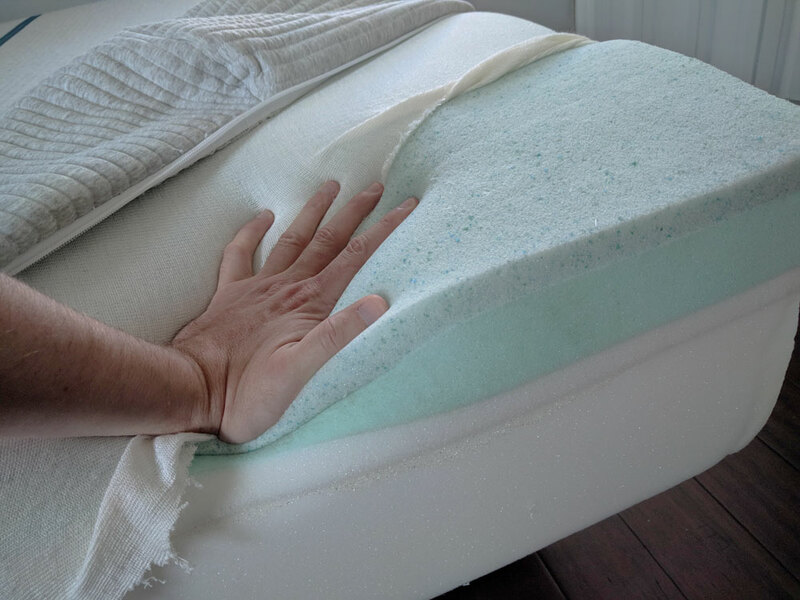 3/4″ TempActiv Gel Memory Foam – Relieves pressure while maintaining a cooler sleep environment. 2″ EverCool Fuze Memory Foam – Promotes breathability and air flow; drawing heat away from your body. 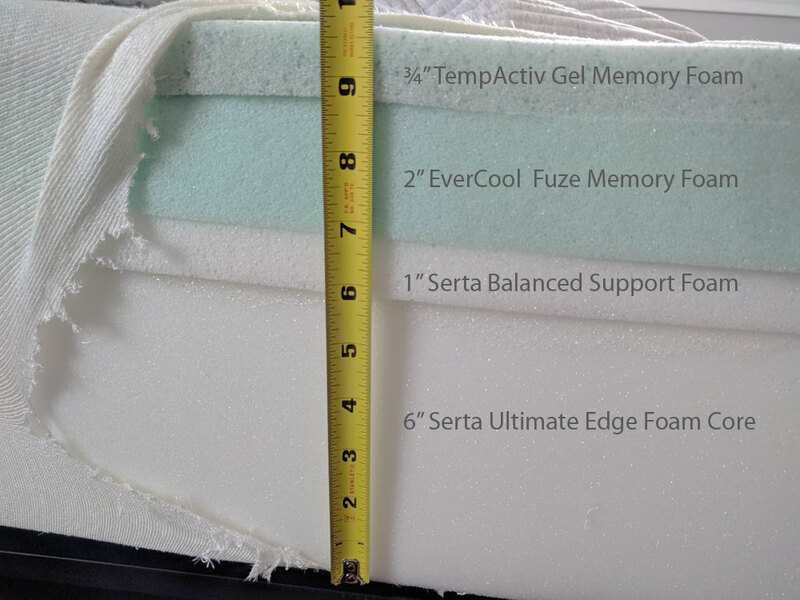 6″ Serta Ultimate Edge Foam Core – Adds extra structure and stability. The Blue 100 Gentle Firm offers solid support and alignment. This mattress is firm but offers just enough contouring for those seeking a medium comfort option. Like most memory foam mattresses, it does a stellar job of limiting motion transfer and partner disturbance. Cooling gels do an adequate job of reducing heat retention for most people. Also, being a firmer mattress, you don’t sink as far into the foam as far. Overall, sleeping hot should not be a concern. This bed is CertiPUR certified to not emit dangerous chemicals into the air. We noticed only a slight odor upon delivery. This scent quickly dissipated within a few days. Not surprisingly, edge support is not a strong suit here. Memory foam mattresses seldom impress in this category. If you like the pressure relieving feel of memory foam but want a more solid edge, consider a hybrid mattress with foam and and coils. Serta mattress and foundations can only be returned or exchanged under the conditions of the iComfort/iSeries 120 Day in Home Trial and Serta 45 Day Comfort Assurance programs. In both cases, you must sleep on the mattress a minimum of 30 nights before initiating a return or exchange. See Serta’s terms and conditions. 10 Year non prorated warranty: While some companies offer longer warranty periods they often require that their is sagging or body impressions greater than 1.5". Serta considers 3/4" or greater Impressions to be a factory defects and are covered under their warranty. Delivery, setup, and removal of your old bedding is free when purchasing direct from Serta. Spring-less memory foam mattresses offer less bounce and buoyancy than coil spring or latex beds. The combination of quality and low price make this mattress an exceptional value. While there isn’t one mattress that will be right for everyone, the Gentle Firm is designed to appeal to the majority. It’s firm but, with just enough body contouring to appeal to most sleepers needs. It’s an ideal firmness level for most back sleepers. It offers great pressure relief while maintaining proper body alignment. The majority of back sleepers should find this mattress quite comfortable. However, different body types interpret firmness and comfort differently. Larger sleepers will sink in a bit deeper than petite individuals and feel as though this bed is softer. Those over 250 lbs. may want to consider a more substantial mattress. On your side, your shoulders and hips bears most of your weight. Your mattress needs enough contouring ability to relieve pressure to these areas. This mattress will accomodate most but not all side sleepers. If you have extreme pressure sensitivities and are looking for deep body hug, we recommend you look further into the Serta Blue lineup for softer options. Stomach sleepers require a mattress that is firm enough to not allow your lower back to dip. This type of sinkage can cause lumbar pain. In general, sleeping on you stomach can cause comfort issues. This can cause you to wake with pain not necessarily associated with your mattress choice. If you must sleep on your stomach, this mattress is a great choice. It’s firm enough for support but soft enough not to cause discomfort while in this position. Limited firmness range: With only one firmness options, the 100 will not satisfy everyone's comfort need. Serta’s Blue lineup does offer several other options ranging from a firm to super soft. If you’re looking for pressure relief, we found the memory foam that Serta used offers a firm but conforming feel. Those who like memory foam but don’t want to sleep hot will like this mattress. The advanced cooling technology keeps your sleep environment comfortable. Couples in search of less motion disturbance will appreciate Serta’s Blue 100. Dense contouring memory foam limits how much you feel your partner move. If you’re looking for a great value the Blue 100 Gentle Firm is a solid product at a great price point. If you like the feel of a traditional coil spring, the Blue 100 may not be for you. Spring free memory foam has a unique feel. You sleep in it as opposed to on it. If you are a fan of a more rigid edge support a spring-less memory foam mattress is not for you. Those seeking a super firm or super soft mattress will not be a good match for this bed. The Blue 100 Gentle Firm is by design a mid range comfort feel. The Blue 100 Gentle Firm is a traditional spring-less memory foam mattress; not a bed in the box offering. This bed uses dense memory and base foams that are too substantial to be rolled into a box. A standard delivery is required. When purchasing direct from Serta, free white glove delivery, setup and removal of your old bedding is included. When purchased at store, retailer’s policies vary but are usually on par with the factory. Additional fees may be charged for removal of old bedding. Note: As with any quality mattress, Its essential a queen or king have a solid foundation and a frame with sturdy center supports. Proper support extends the longevity of your mattress. Serta offers a matching foundation that is ideal for this purpose. Blue 100 foundations range from $165 for a twin to 350 for King size. Serta’s Blue 100 Gentle Firm offers a solid value for those seeking a quality memory foam mattress. Its mid range comfort feel will accommodate most but not all firmness preferences. Those seeking deep body hug or an ultra firm should choose another option. This bed is ideal for couples who’s firmness preferences differ. It’s a well rounded mattress. Consumer confidence should be high when making a purchase from the Serta Mattress Company. We expected a lot and were not disappointed. For more information, visit Serta.com.